Pictured above are (left to right): Suzanne Detar, Daniel Island News (sponsor); Rick Mosteller, Spiritline Cruises (sponsor); Joannah Sampson, Cainhoy Elementary School (beneficiary); Betsy Brabham, Dockery’s (sponsor); Kathleen Forbes, East Cooper Meals on Wheels (beneficiary); Jane Baker, Daniel Island Property Owners Association (sponsor); Stephanie Kelly, East Cooper Community Outreach (beneficiary); Jennifer Wilson, Camp Happy Days (beneficiary); Rotarian George Jucha, Duck Race chair; Kate Buckholz, Carolina Youth Center Development Center (beneficiary); Rob Fowler, WCBD-News2 (sponsor); and Scott Varn, president, Rotary Club of Daniel Island. 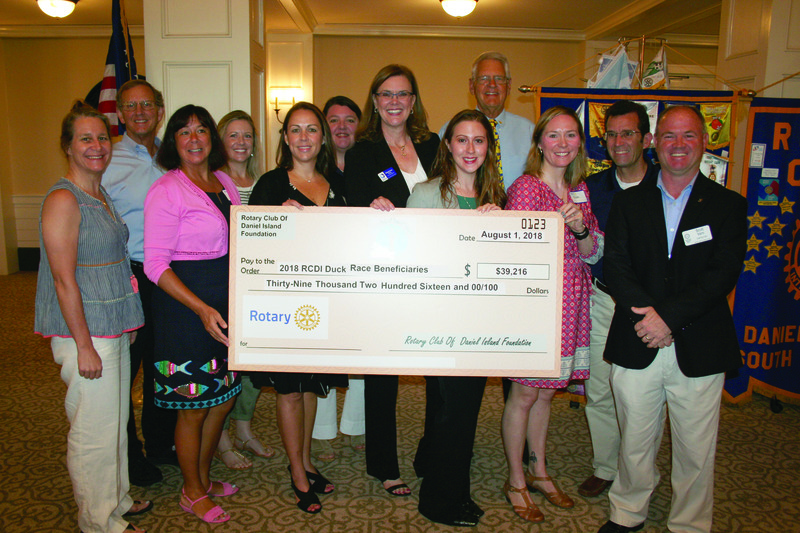 Rotary Club of Daniel Island members call it “one of the best, and perhaps most rewarding, meetings of the year.” Last Wednesday, August 1, they distributed the proceeds of this year’s Rotary Duck Race on Daniel Island to several local non-profit organizations: Camp Happy Days, Cainhoy Elementary School, East Cooper Community Outreach, East Cooper Meals on Wheels, and the Carolina Youth Development Center. Collectively, the beneficiaries received a total of $39,216.